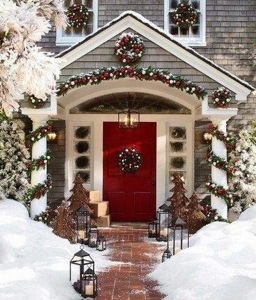 I would love this kind of front entrance. As far as decorating goes. I have two problems though…one, I’m broke. And two, I live in Astoria and the wind is merciless out here at times. Anything I put out side needs to be able to stay put when gusts of wind of up to 40+ mph come through here. Seriously. Much to my chagrin, my front entrance is not nearly as decorated as I would like to be. But I’m gonna be happy with what I have and keep my eyes open for sales after Christmas and during the summer. 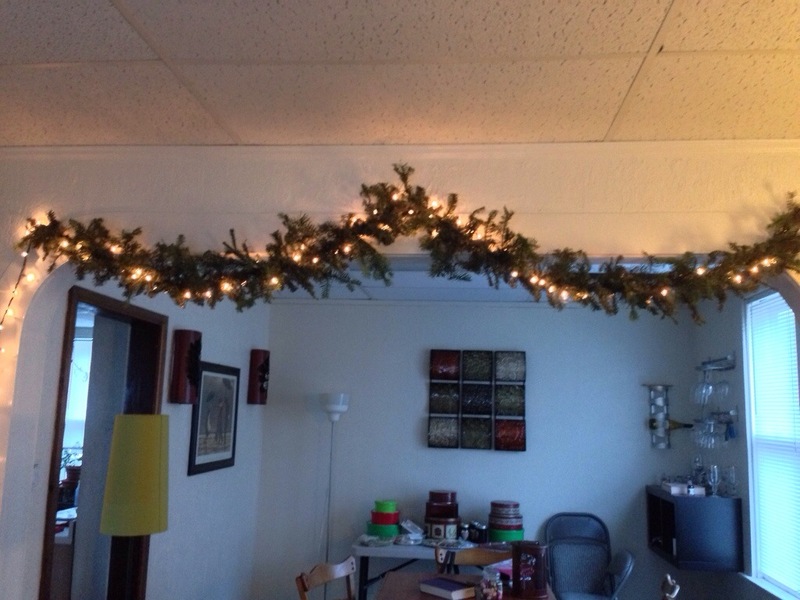 Another thing with getting garland close to looking like that, is it costs about $50-$100 for garland that is pre-lit and pre-decorated and full like that. Like I said, I’m broke. Or close to it. I did happen to have a few bucks to pick up a strand of garland at Target when I was last in the valley. Cause there is no garland out here. At least not fake garland that is only a couple of bucks. Not even Dollar Tree. 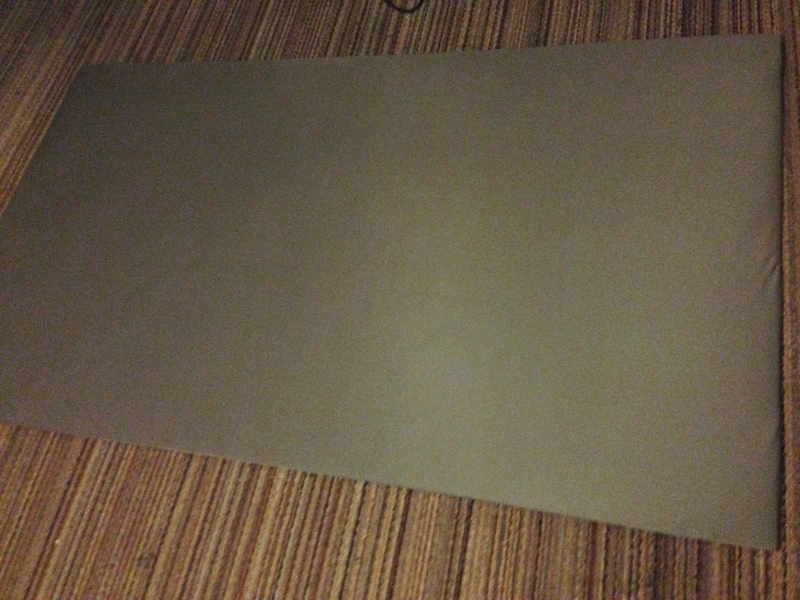 Well I got it home and figured it would look about like this: Pretty skimpy and little. Yuck. This fantastic woman and fellow blogger posted fab directions on how to pimp your garland. . She has much better picks and more steps and all these wonderful decorations she added to her garland. I kept mine pretty simple. 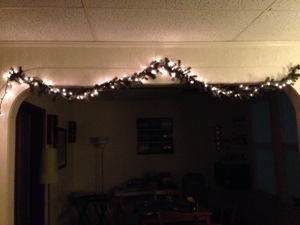 I felt though that you all should see the original and be as inspired as I was to do my garland. 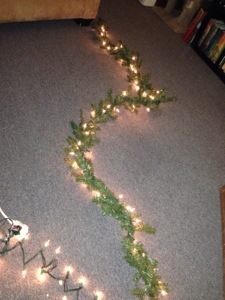 I then fluffed out the fake little branches and hung it over the arch way between the living room and the dining room. It still looked a little….uh…scant… So now I took some of those extra clippings that I had from my tree and that I picked up from the tree lot that was just laying there. Kelly (the original blogger) used 4 or 5 different fillers. A few different evergreen branches, some green bush clippings and holly. I noticed that there are holly bushes in the Safeway parking lot across the street and suggested to Brandon we come over when it got dark and clip some. He told me that if I wanted to sneak over in the middle of the night and clip some branches I could do it on my own. And to make sure to do it on the far side of the parking lot so I wouldn’t be associated with our house and him. Or spotted sneaking with a bunch of pokey bush trimmings through the neighborhood. I asked him where his sense of adventure was. 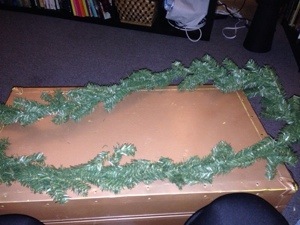 Once I had it hung I used the tree clippings I did have and stuck them into the garland here and there to fill it out. Can you see the difference? I can. Brandon thought it was a real strand of garland when he saw it. He couldn’t tell that it was originally fake with real sprigs stuck in. He actually tried to argue with me about it…seriously? Don’t argue with me. I know what I’m doing! I feel like it could use some more….something. Some more pop probably. Brandon’s mom has some fantastic fake garland that is prelit and then she adds these really cute mini ball ornaments to it. I would love that. But Brandon said no. Maybe next year. I’m gonna keep my eyes peeled for more garland for next Christmas. Hopefully enough for all our railings and doorways…. and maybe one day like this lovely home…. Sometimes I feel like I am just one broken coffee cup away from being a hoarder. I have only seen a few episodes of the show Hoarders, and it honestly just makes me upset. Seriously! I don’t understand how other people, their loved ones, can live in the chaos, and filth, and gross-ness of a hoarded house like they have on the show. I guess saying that makes me feel better that I am not even close to being at that stage of hoarding. 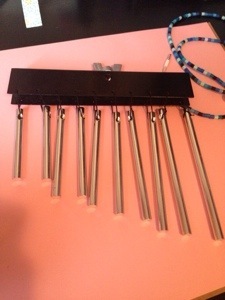 My loving husband donated to my crafty cause, a set of chimes from an old drum set. It may be odd to say this, but I want that wind chime. My grandparents still have it and I WILL INHERIT IT ONE DAY!!! Or I’mm sneak onto their porch and steal it one night…hmmm. Anyway. I now had some chimes to make my own wind chime or two and now all I needed was something to attach them to. Then it finally hit me, as I lay in bed one evening, that I now have a brand new iPhone. 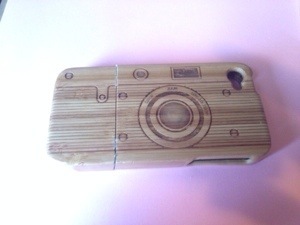 And that my very cool handmade bamboo phone case for my smaller previous iPhone is no longer useful! So why not make it into a wind chime! Then I got out my power drill!!! 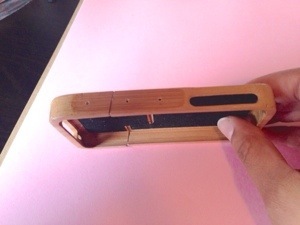 OK my husbands power drill… and drilled a few small holes. I think I will spray it with my sealer spray before I put it outside, since it’s bamboo and will most likely rot in the wonderful Northwest Winter Weather. 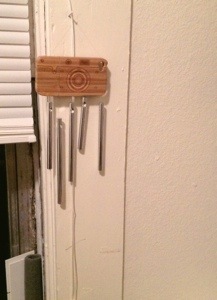 I have more chimes left over, what other items that might be laying around a home would make a good wind chime? P.S. Today I will leave you with a special note! I enjoy doing projects around the house! It’s fun to make up your home and personalize it. 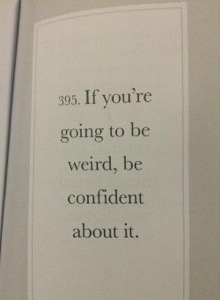 I found this thing on Pinterest… All my sentences start that way now. FYI: I freaking love Pinterest! 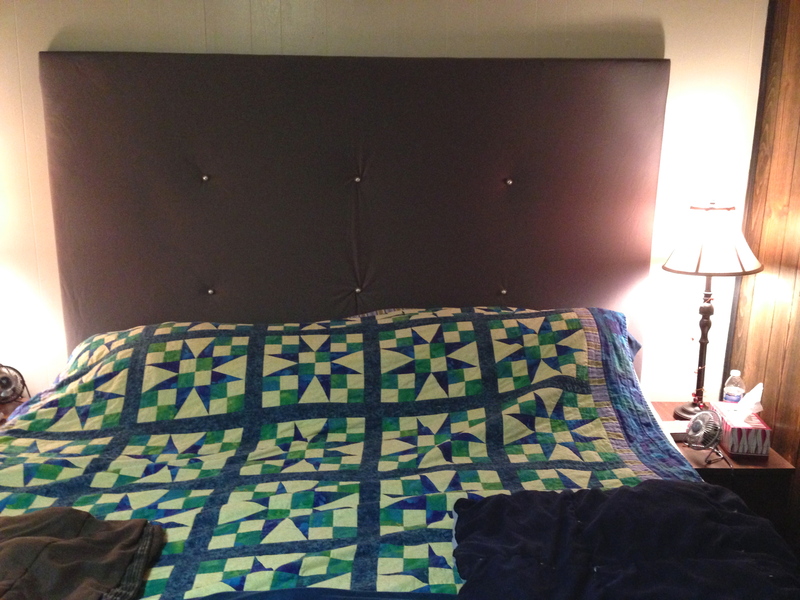 So this thing I found was a DIY headboard. 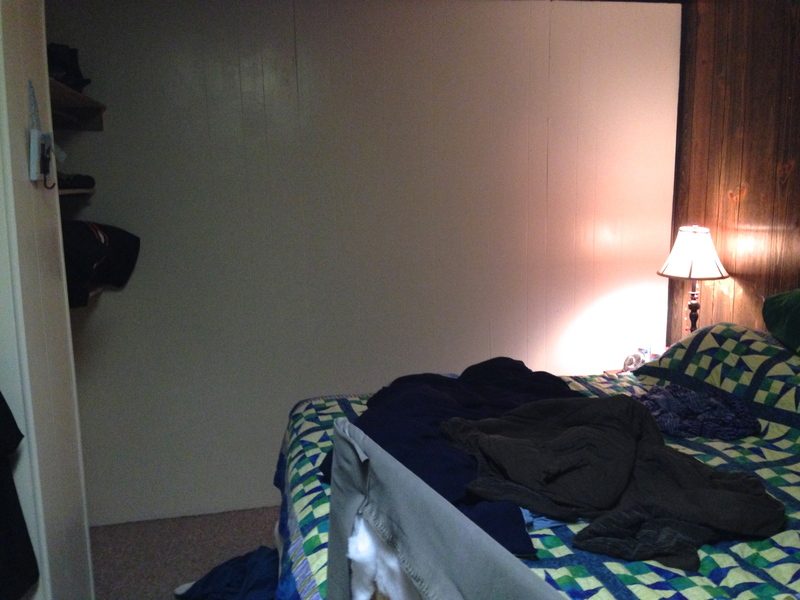 The poster, who blogged about her headboard, made it for super cheap. She got pretty much all her materials on sale. I had some sale items but not all the super cheapness she had. Honestly this was a very simple project. 1. Measure if you need to and cut to size. That’s what Brandon’s doing here. 2. 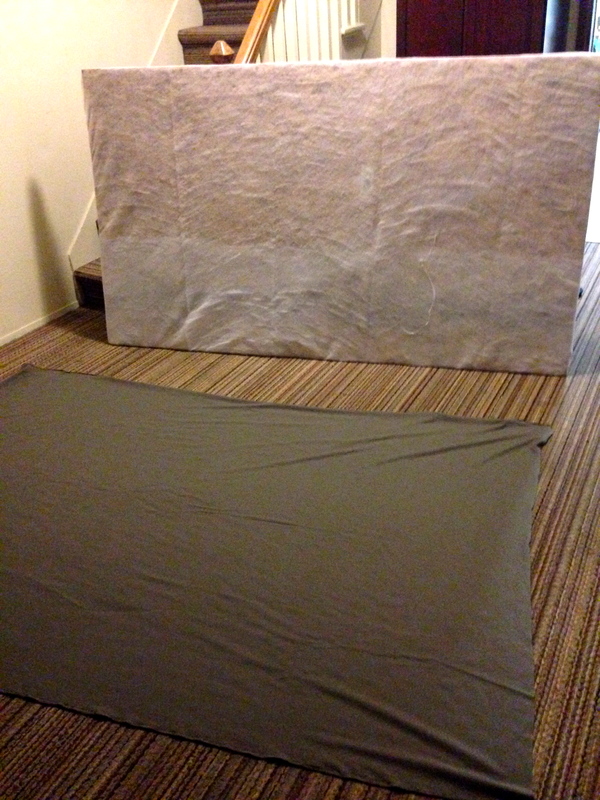 When putting the batting and the fabric on, make sure you floor is clear and you stretch it tight. 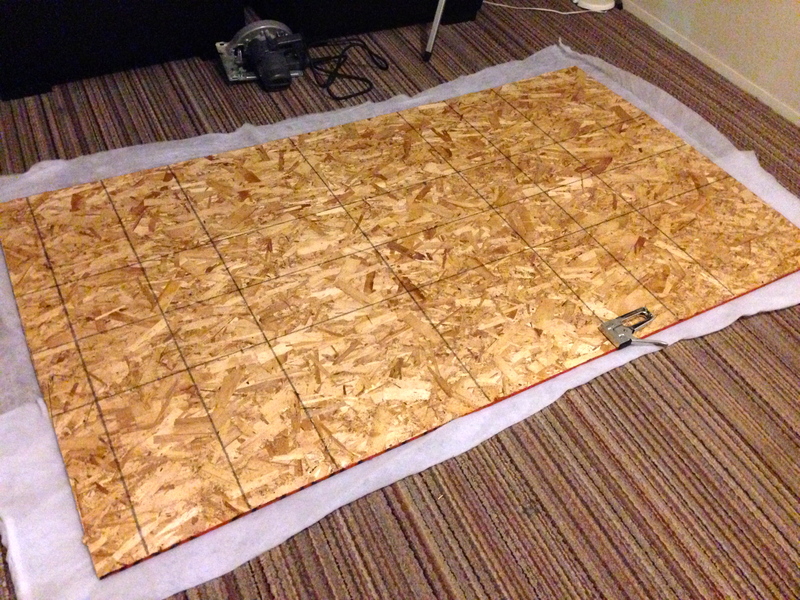 And use a staple gun. 3. 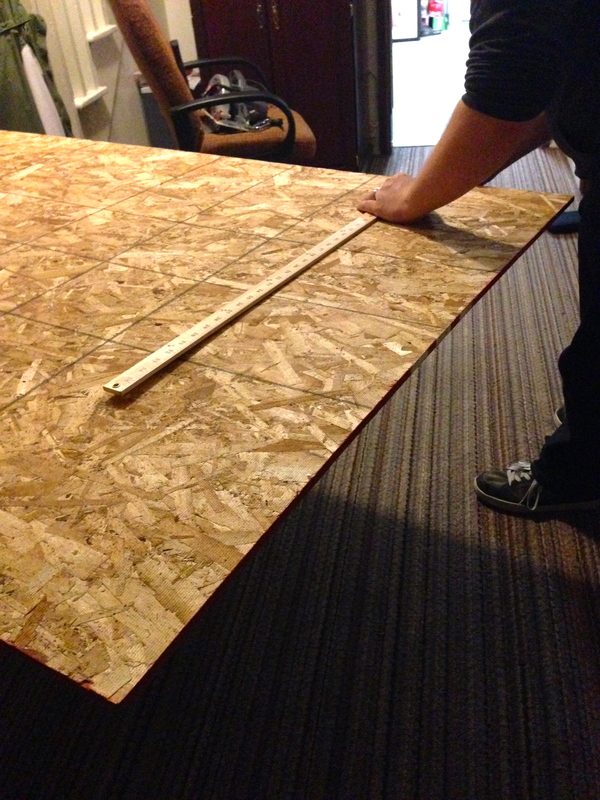 Measure twice, mark once! 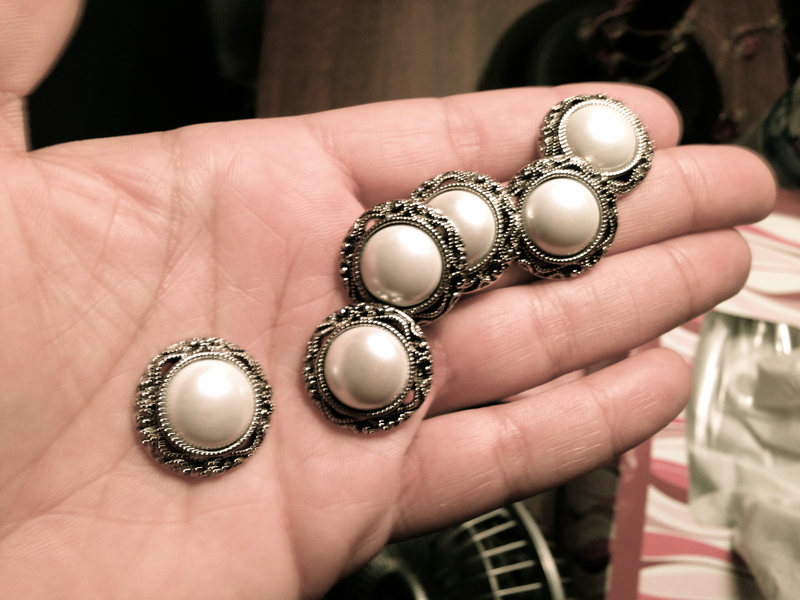 She suggested doing staples where you want the buttons to go to create the indents. 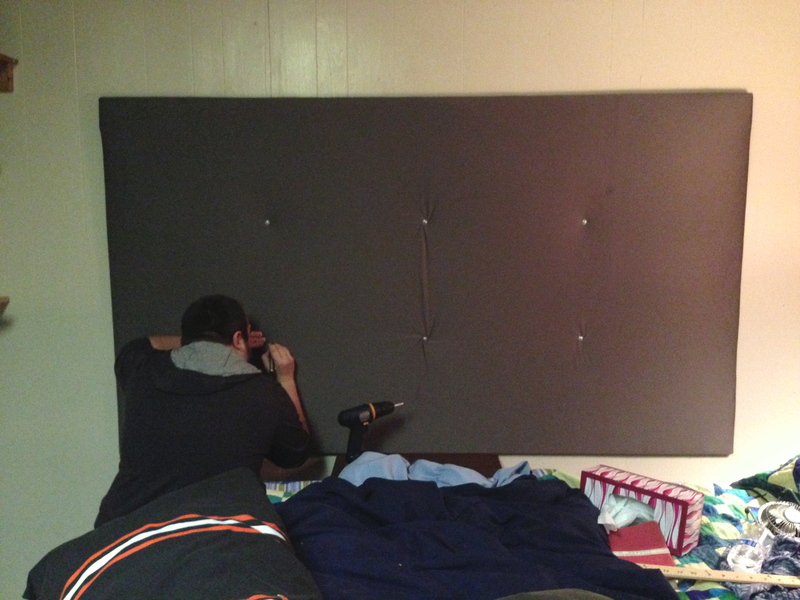 4.Brandon’s idea for hanging it was to use washers to protect the fabric and batting and screw it straight into the wall where I hot glued the buttons to cover the screws.